is coming to tomorrow’s car. This has been our mission ever since we first invented Phantom. And today we’ve done it again. 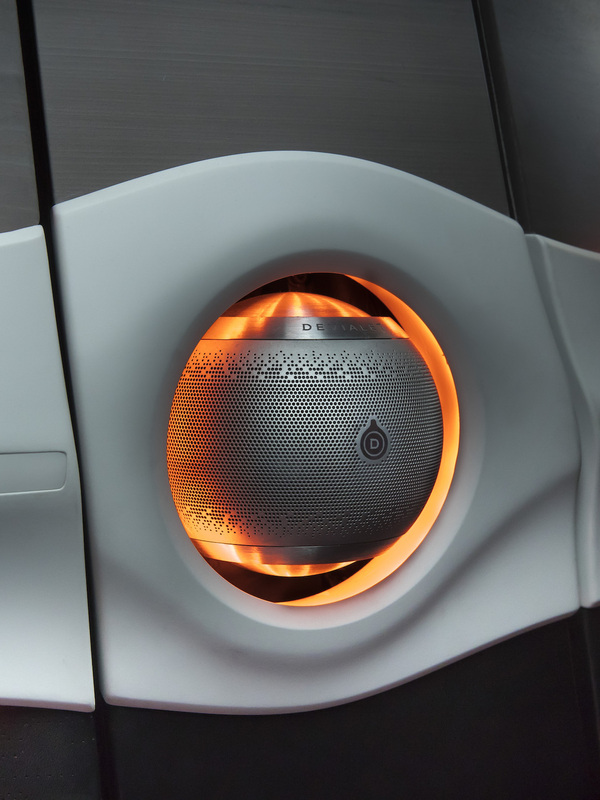 Devialet brings its technologies to SYMBIOZ, Groupe Renault’s latest demo car, through three major breakthroughs. Every risk we’ve taken and every record we’ve broken with Phantom expresses our absolute ambition: to deliver the emotion of sound to the widest audience possible. By defying the limits of sound reproduction and size efficiency, we were able to bring you concert-level emotion, live in your living room. As we enter the era of autonomous vehicles, entertainment will take a front seat. And your car will become the new living room: a theatre for beautifully immersive audiovisual experiences. That’s why we’ve joined forces with Groupe Renault, one of the world’s leading car manufacturers, to imagine the audio experience in the car of tomorrow with the revolutionary technologies of Phantom. When Renault told us about their vision for the future of automotive, we were proud and excited to rise to a new challenge: to take the Devialet experience into the car of tomorrow and magnify the automotive journey through sound. Designed and built for SYMBIOZ, an electric, autonomous and connected demo car illustrating Groupe Renault’s vision for the future of mobility, this pioneering system allows us to achieve our dream of furthering audio innovation. By bringing our expertise and technologies to new territories. A radical new challenge. Three major breakthroughs. Car-making is characterized by tight size, volume and weight constraints. This required rethinking the sound architecture from A-Z. Three major breakthroughs enabled us to reduce overall audio system size and speaker number while delivering the Devialet implosive sound experience. First we miniaturized Phantom. To reduce necessary air volume to 6x less than traditional systems. In-door speakers and the subwoofer are replaced by miniaturized Phantom. Thanks to our unique size reduction technology, this new architecture reduces the necessary acoustic load of each module: to only 1L. That’s six times less than traditional systems. Then we invented the Diffusors. To deliver ultra-immersive sound with fewer speakers. Placed in empty spaces or embedded in AC and de-icing pipes, the ‘Diffusors’ transform the car’s passive parts into a network of virtual speakers. Connected to the modules, they produce an outstandingly wide soundstage. As the audio industry races to add more and more speakers to vehicles, we’ve chosen the opposite route, achieving unthinkably immersive sound with greater acoustic efficiency. Lastly we used our spatial rendering technology. To bring concert-level emotion on the road. Built into the central unit, our spatial rendering technology channels each sound to the correct speaker, according to its type or frequency. Direct sounds such as voices are sent to each module’s front full-range speakers, while background or ambient sounds are directed to the Diffusors for unrivalled spatialization. So you can experience concert-level emotion, on the road. Combined with Devialet’s patented signal processing technology, this revolutionary architecture redefines the automotive journey. Devialet’s audio system for Groupe Renault SYMBIOZ demo car is currently being presented to the press as part of the Demo vehicle test drives.